The parking lot at 7194 Clairemont Mesa Boulevard is rescheduled to be paved Friday and Saturday, March 4-5, 2011. Depending on the weather, paving may be rescheduled again to another weekend; we will inform you if it is delayed again. Parking will be more limited during this time. Please feel free to enter through the back entrance during this time. However, we will be open during this period. We apologize for any inconvenience! Update: This class has already sold out. Curds and Wine is pleased to host a very special cheesemaking class on Saturday March 12th to benefit Slow Food Urban San Diego. 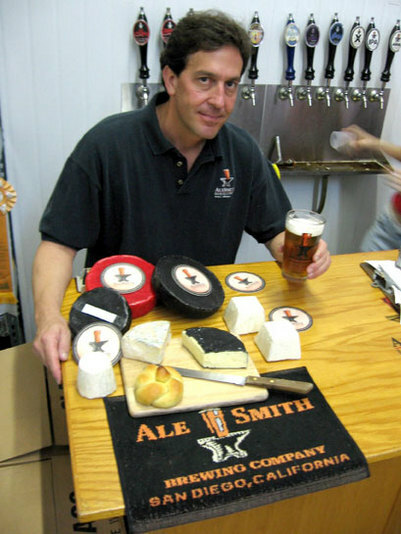 Peter Zien, from Alesmith fame, is also a master cheesemaker and will be leading this class. Peter will talk about the history and science of cheesemaking, and show you how to make different types of cheeses. You will also receive a 10% discount off of any purchases following the class. This class will definitely sell out fast! Cost is $20 for Slow Food members and $30 for non-members. Purchase tickets here. If you are not currently a member of Slow Food, you can join here (list Slow Food Urban San Diego as your local chapter). By joining this great organization, you are supporting the community and the environment through the promotion of more informed decisions about how and what we eat, where our food comes from, and the impact of our food decisions on the environment. It is also a great way to learn more about local resources for great produce, restaurants, community farms, and more. Get involved today! Interest in cheese making classes has been overwhelming, so we are happy to announce ongoing, private cheesemaking classes at Curds and Wine. 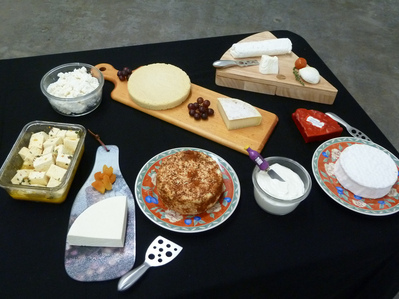 Our first cheese making class will be held Wednesday March 30th from 1 to 4 pm. At this class you will learn the fundamental processes behind fresh cheesemaking as well as the techniques for making pressed cheeses and aged cheeses such as cheddar and gouda. We will make fresh cream cheese, ricotta, and queso fresco, and demonstrate the processes involved in making feta, swiss-style cheeses and camembert/brie-style cheeses. We will have samples of the various styles of cheeses you can make at home from Venissimo, as well as other refreshments. Finally, you will receive a packet with a recipe booklet to make the cheeses from the class as well as basic supplies to get you started with your cheesemaking. You will also receive a 10% discount on any purchase in the shop following the class. The fee for this class is $50 per person, and class size is limited to 12 participants. You can sign up for this class and purchase tickets for March 30th here. We will have a similar class the following Saturday April 2nd from 6:30 pm to 9:30 pm. Purchase tickets for the Saturday evening class here. You can always see ongoing events at Curds and Wine on our Calendar of Events. Many of you know how wonderful homemade ricotta is -- now it's time to take your ricotta to the next level. Ricotta salata is a pressed, salted wheel of ricotta that has a fresh flavor and firm texture. It's great on salads, or on braised greens as in the recipe below. 1 gallon milk -- whole or low fat, though you'll have better results with whole milk; pasteurized milk from the grocery store is fine! Put the milk into the pot and add the dissolved citric acid. Heat the milk with direct heat to about 185° F; you should see the milk form fluffy white curds that float in the liquid whey. If you don't see the curds separating cleanly, add another dose of 2 tsp citric acid dissolved in water, the curds should instantly separate after this addition. Stop stirring at this point and turn off the heat. Put the cheesecloth in the colander in a sink or large bowl and carefully ladle the curds with the slotted spoon or skimmer into the cheesecloth. If you want to pour the curds into the cheesecloth, pour very slowly and make sure you have a very fine cheesecloth, or all of the curds will pour through. Tie the ends of the cheesecloth together and hang the ricotta for about 30 minutes to drain. Take the ricotta out of the cheesecloth and put it in a large bowl. Add 1 Tbsp cheese salt and mix thoroughly. Press the curds into a ricotta basket and put another empty basket on top with a glass of water to press the cheese; press at room temperature for 1 hour. Remove the cheese from the mold and flip it over, then press with the glass of water at room temperature overnight. The next morning take the cheese out of the mold and lightly rub surface evenly with cheese salt, as well as smoked paprika/pimenton if desired. Place the cheese back in the mold and move to the refrigerator. Turn the cheese every day for one week, lightly salting extra days if desired. Keep the cheese uncovered unless it starts to dry out too much, then lightly cover it with plastic wrap (do not wrap tightly, the cheese should dry out a little bit during this time). The cheese is ready to eat after one week, and can be aged for up to 4 weeks. If any undesired mold appears on the cheese, rub it off with a clean towel and some salt. You should get about 1/2 pound of cheese. This recipe was inspired by this guest post from David Greenberg on the cheesemaking blog imakecheese.com. If you have a cheesemaking blog or know of a good one, please let us know! A really yummy way to use your homemade ricotta salata! Great as a side dish with lamb chops and a bottle of homemade Carmenere or Syrah. Wash the greens, but do not dry. Trim large stems and coarsely chop. Set aside. Warm 3 tablespoons of olive oil in a large pan over medium-high heat. Add the onions and chopped stems and saute for 4 minutes. Add the garlic and saute briefly, then add the greens, chicken broth, soy sauce, and pepper. Cook, stirring often, until the greens have wilted and become tender, about 10 to 12 minutes. Transfer the cooked greens to a serving plate and crumble the ricotta salata cheese over the top. The two more Limited Edition wine kits will be released this month! These include Austrian Gruner Veltliner from Winexpert, and the Rhone white blend Marsanne-Viognier-Roussanne from Cellar Craft. These are two very unique, amazing whites. You don't want to miss out on them! If you forgot to sign up for these kits, there are a few extra ordered, but they will be sold on a first-come first-served basis. If you are interested, please email me or call me at the store to check availability. It's not too late to register for the Winemaker Magazine conference in Santa Barbara, CA. The conference is May 20-21, and it's a great place to improve and expand your winemaking skills. There are several amazing seminars and workshops at this conference specifically about kit winemaking, as well as making wine from fresh/frozen grapes and even vineyard management. It's also a great place to meet winemakers at every level, and get new insights and perspectives of winemaking. Whether you're new to cheesemaking or have a cheese locker full of aged cheddars and gouda, join the San Diego Cheesemakers group. This is a new list group set up by local cheese maker and home brewer Chris Banker. I'm sure the discussions on this list will be very informative and educational, and may turn into a local cheesemaking club! Join the group here! Watch for Curds and Wine on Channel 8 news at 5 pm with Larry Himmel Thursday February 24th! Larry Himmel of KFMB Channel 8 in San Diego will visit Curds and Wine on Thursday, February 24th. His interview will air on the 5 pm evening news, we hope you can catch it! Also look for Curds and Wine mentioned in Caron Golden's "Local Bounty" section of the March issue of San Diego magazine!